Dining table, teak and walnut, Germany, 1960s Well designed rectangular-hexagon dining-/conference table with double top and robust yet elegant shaped legs. The black lacquered top has a modest and formal appearance, which combines very well with the more robust frame. The double top is in veneered teak is very functional, since it offers storage space. The solid frame is made of solid walnut, and is beautifully shaped. 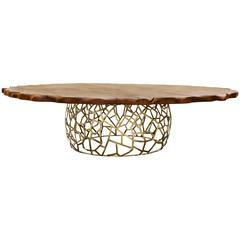 This creates a well proportioned, elegant table, ideal in use as a dining tale, conference table, or as a large desk. The table is in good condition with some signs of age and use. The black lacquered top contains some skin-deep scratches, which will be solved in our in-house atelier. There are some small chips in the teak veneer missing on the lower tabletop. 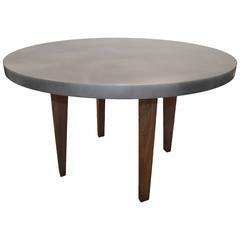 Gordon & Jane Martz tile top and solid walnut dinette dining table. 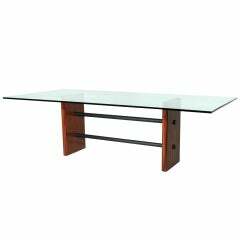 Rosewood and solid metal double-stretcher table with glass top. 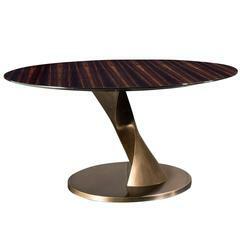 The base pedestals have elegantly curved edges. Base measures: Length: 55" Width: 17.5" Height: 29"
Dining table aged brass with stained oak top and handcrafted aged brass structure base. 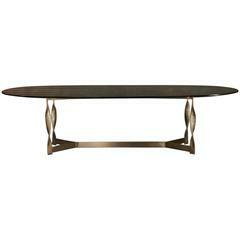 Long table torsade with solid ebony wood top, handcrafted bronze structure. Available in L 300 x D 130 x H 75cm, price: 22950.00€. Available with solid oak top, price: 22500,00€.